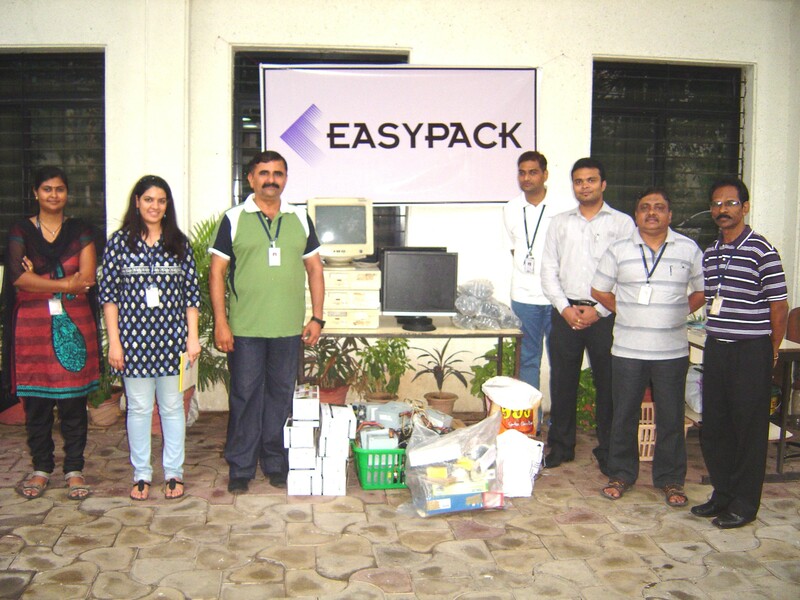 Easypack pioneers e-waste recycling in Nagpur, with Ecocentric (TM) . Taking forward our commitment to ensure an eco friendly sustenance of our business, Easypack recently gave away a large amount of e-waste for environment friendly recycling. In Nagpur, we are the first company to give e-waste for environment friendly recycling. The e-waste was gathered over a period of time and given in bulk to EcocentricTM, a Mumbai-based company specializing in ecofriendly E-recycling. Easypack gave away a large number of electronic waste goods such as motherboards, mobiles, keyboards and other computer accessories. The waste was collected by a company representative from Easypack’s premises and taken to an eco friendly recycling unit. It is a matter of great pride and honor for us, to be associated with a practice of environment friendly e-recycling and we shall ensure the continuation of this practice. Easypack urges its fellow domestic businesses, employees and individuals to dispose off e-waste in a safe and environment friendly manner. As part of our undertaking to promote and propagate this eco friendly practice, we encourage all the corporate and domestic sectors in Nagpur to channelize the disposition of their e-waste through us. Want to add articles to E-recycle Basket? Contact Us! It is recycling or reuse of computers or other electronic devices for alternate usage. 1. They are a valuable source for secondary raw materials, if treated properly. 2. If disposed improperly, they are a source of toxins and carcinogens (cancer causing agents). 3. Improper disposition causes tremendous hazards to bio-environment in terms of air pollution and land pollution. What can be given for e-recycling? And any other goods that use electricity for functioning. This entry was posted in Corporate Social Responsibilities on 06/19/2013 by easypackindia. Easypack Employees with dignitaries and children from Shraddhanand Anathalaya. In today’s world , it is imperative to have substantial exposure to computer technology , if one aims for a better future. With this view, Easypack recently donated seven sets of computers to Shradhanand Anathalaya , Nagpur. The aim of this donation was to provide an opportunity to the orphans, to get introduced to computers . The initiative was well supported by the staff of the orphanage. The childeren were very excited to see the computers.This donation has allowed Easypack to make a fraction of contribution towards bridging the digital divide in the society. Easypack firmnly believe that if these children are ever to have a chance, an opportunity to change their destiny though education, then they must have access to technology. It is a matter of pride for us to announce that this computer donation program has had a wonderful start, and we look forward to sharing many more such initiatives as they occur. This entry was posted in Corporate Social Responsibilities on 06/15/2013 by easypackindia. Easypack teams up with EcoCentric(TM), Mumbai to support safe E-recycling. Advancement and rapid innovations in technology, falling prices of available technology, and planned obsolescence of outdated electronics have resulted in a fast-growing surplus of electronic waste around the globe. As per a report by UNEP, India is estimated to increase the amount of e-waste produced, by almost 500%, over the next decade. This alarming increase will result in significant deterioration of human health & environment. As part of our philosophy to ensure that our business thrives in a safe and healthy environment, we have teamed up with EcoCentric, a e-recycling company based in Mumbai, that offers electronic waste recycling solutions to responsible companies who want to discard their ‘E-waste’ in an eco-friendly manner. We are proud to be the first company in Nagpur, to be associated with EcoCentric. Through this association, we plan to start the process of making the surrounding corporate and domestic sectors aware of the hazards of e-waste and at the same time provide them solution and guidance to dispose off their e-waste in a safe and environment friendly manner. As part of our undertaking to promote and propagate this healthy practice, we encourage all the corporate and domestic sectors in Nagpur to channelize the disposition of their e-waste through us. This entry was posted in Corporate Social Responsibilities on 04/09/2013 by easypackindia. 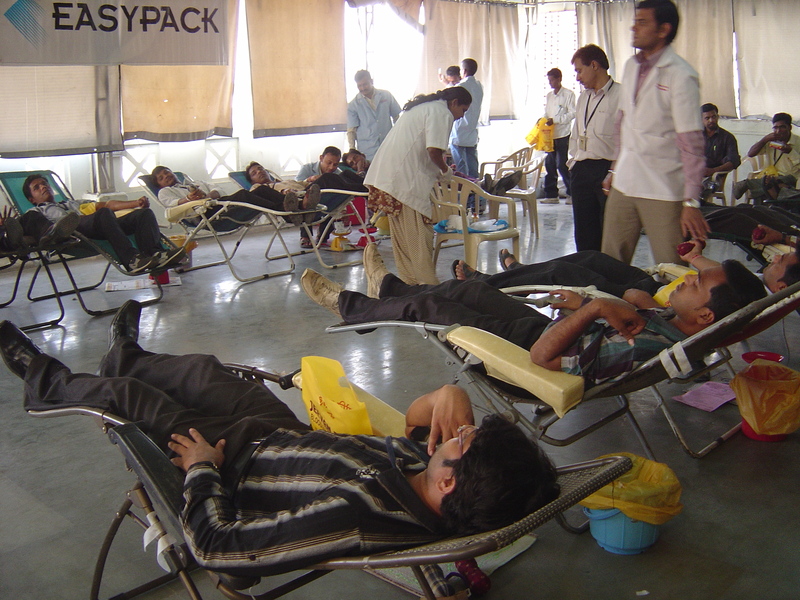 Easypack organized its annual Blood Donation camp on December 1st, 2012. The camp was organized in the company’s HiTech office. Like every year, large number of employees participated in the blood donation camp. The camp was organized with Jeevan Jyoti Blood Bank, Nagpur. The doctors and the staff of the blood bank extended their fullest cooperation to make the camp sucessful. Before donation, each donor’s health vitals such as blood pressure, hemoglobin etc. was checked by medical officials from Jeevan Jyoti blood bank. Post donation certificates, T-shirts and snacks were distributed among the donors. We are proud to announce that this year 61 employees participated in the camp. In this regards, we would like to congratulate our team members for participating in this noble cause, making the camp , a grand success. This entry was posted in Corporate Social Responsibilities on 12/05/2012 by easypackindia. 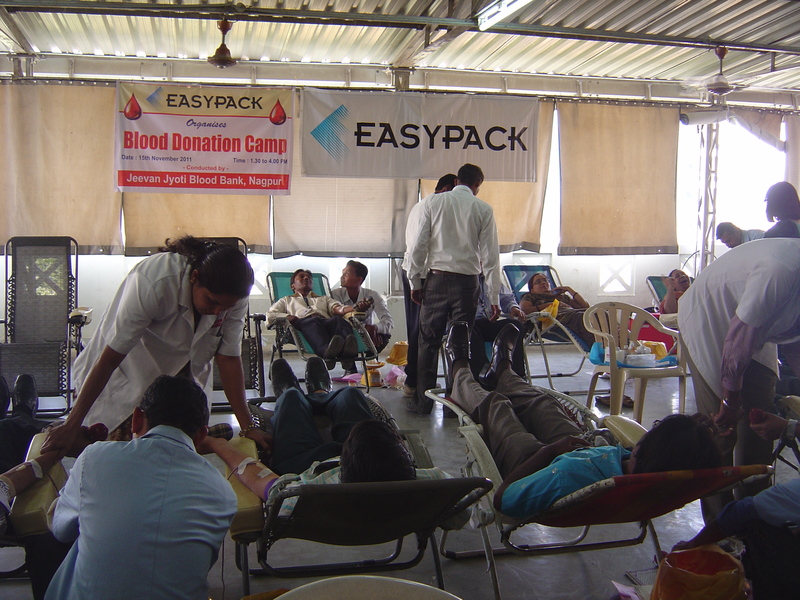 Easy pack organized its annual Blood Donation camp on 15th of November 2011. The camp was organized in the company’s HiTech office from 1:30 pm to 5:00 pm. . Like every year large number of employees participated in the blood donation camp. The camp was organized with medical aid from Jeevan Jyoti Blood Bank, Nagpur. The doctors and the staff of the blood bank extended their fullest cooperation to make the camp a success story. The camp was inaugurated by chief guest Dr. Ravi Wankhede (Director, Jeevan Jyoti blood bank) and Mr. Arun Saxena (CEO, Easypack Software Inc.). The camp started with donors filling up forms pertaining to their health. Before blood donation, each donor’s blood pressure and health history was checked by medical officials from Jeevan Jyoti blood bank. Post donation, certificates and T-shirts were distributed by the blood bank and snacks were provided to donors. We are proud to announce that this year 58 employees participated in the camp. In this regards, we would like to congratulate our team members for contributing to the campaign in such large numbers and making it a grand success. We would also like to express our gratitude to the director and staff of Jeevan Jyoti Blood Bank for their help and support in organizing this camp. With the success of this year’s blood donation camp, we are confident that in future our company will continue to extend support towards this noble cause. We hope this camp will motivate and inspire more team members to participate in our future social initiatives. This entry was posted in Corporate Social Responsibilities on 11/19/2011 by easypackindia. As a corporate social responsibility initiative, our company is dedicated towards contributing to the society by supporting various social causes. One such initiative is the Blood Donation Camp organized every year. Numerous people die during surgeries due to lack of adequate blood supply on time. According to medical experts, one unit of blood can save the lives of as much as three people. Easypack believes in contributing for such a life saving cause by organizing annual Blood Donation initiative. We firmly regard this noble donation to be our duty and above any caste or religion. This year, Easypack has organized the Camp on 15th of November, 2011. The camp will start at 1:30pm, in the office premises (Hi-Tech office). Our partners in this initiative are Jeevan Jyoti Blood bank with whom we have organized several camps in the past. Easypack is proud to announce that our employees participated in huge numbers during the past camps, making the activity incredibly successful. This year too we encourage and urge our team members to participate in the Camp and contribute to this noble cause. This entry was posted in Corporate Social Responsibilities on 11/13/2011 by easypackindia. Easypack has comepleted 12 years successful journey on 1st May, 2010. It is a matter of great pride for all the team members who have been a part of this eventful journey. This entry was posted in Corporate Social Responsibilities on 05/01/2010 by easypackindia.